This stir fry is quick, easy, delicious and packed full of vibrant colours and flavours to make a fun and healthy family dinner. 1/2 teaspoon ground ginger (or 2cm of fresh ginger, grated). Peel the carrots, then split each lengthways and slice into semi circle-shaped discs. 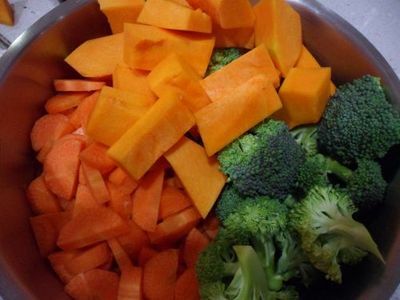 Chop the broccoli into individual, bite-sizes florets, and slice the pumpkin into about 1cm cubes. Put these into a steamer and steam for about 10 minutes until the vegetables are soft but retain some of their crispness (to measure, steam until the broccoli becomes bright green). 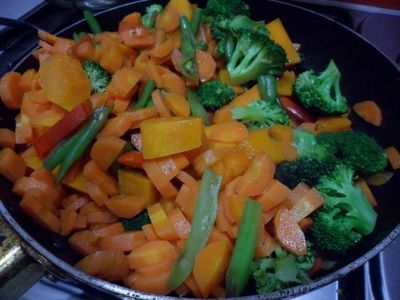 Once steamed, remove from heat and immediately run the vegetables under cold water to retain their crisp. While waiting for the steaming to be completed, slice the capsicum into strips and set aside. 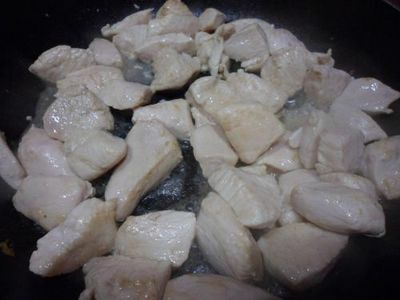 Slice the chicken breast into smaller chunks. The aim is to be able to eat each chunk with one bite, so slice into 1cm or 2cm chunks accordingly. In a wok or large fry pan, heat the olive oil. Add ginger, then place the chicken chunks in. 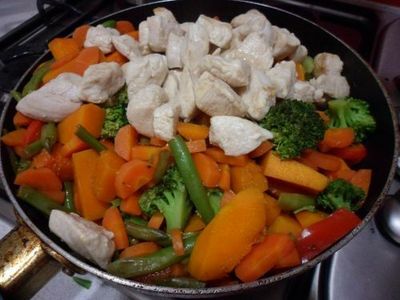 Cook the chicken until tender, then remove from the chunks from the pan and set aside in another bowl or plate. Before finishing the cooking stage, be sure to take out a piece of the chicken and slice it in half to make sure it is cooked all the way through. In a separate bowl (or in the pan once the chicken has been removed) mix the oyster sauce, chicken stock powder and water. 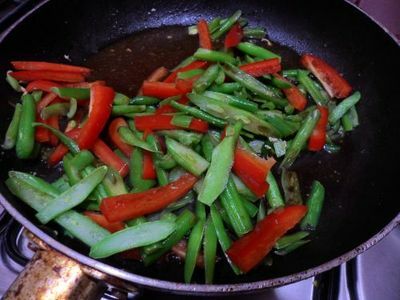 Heat this in the pan or wok, then add the capsicum strips and green beans. Stir fry these for about 2 minutes, until tender. Add the steamed vegetables and toss these through the capsicum and beans. 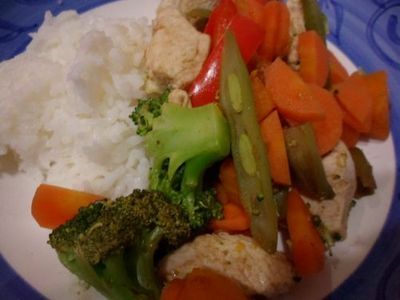 After about 2 minutes of stirfrying, add the cooked chicken chunks back into the pan and toss these through with the rest of the vegetables. Best Christmas lights in Melbourne?